Together we are spreading the word and effecting change, albeit one town at a time; maybe even just one person at a time - but changing hearts and minds requires patience and persistence! I hope you will all consider passing this blog along to others, and I hope my book will continue to convert the "naysayers". Please let me know your thoughts and also please consider signing up for a group discussion with me about the disease of addiction, spurred by my novel, "Addiction on Trial". Just go to the Book Clubs tab above. Thanks and keep up the fight! The article below was written by Charles Eichacker in the May 2014 Health Quarterly, Ellsworth Maine. Thank you Charlie !!! Posted in Author Blog. 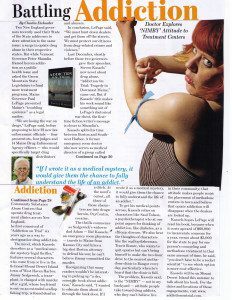 Tags: Addiction Advocacy, Addiction Help, Addiction Is A Disease, Addiction On Trial, Dr. Steven Kassels on May 16, 2014 by skassels. GREAT NEWS: PARITY FOR MENTAL HEALTH AND ADDICTION IS IMPLEMENTED. Posted in Author Blog. Tags: Addiction, Addiction Help, Addiction Treatment, Dr. Steven Kassels, Treatment on November 12, 2013 by skassels.